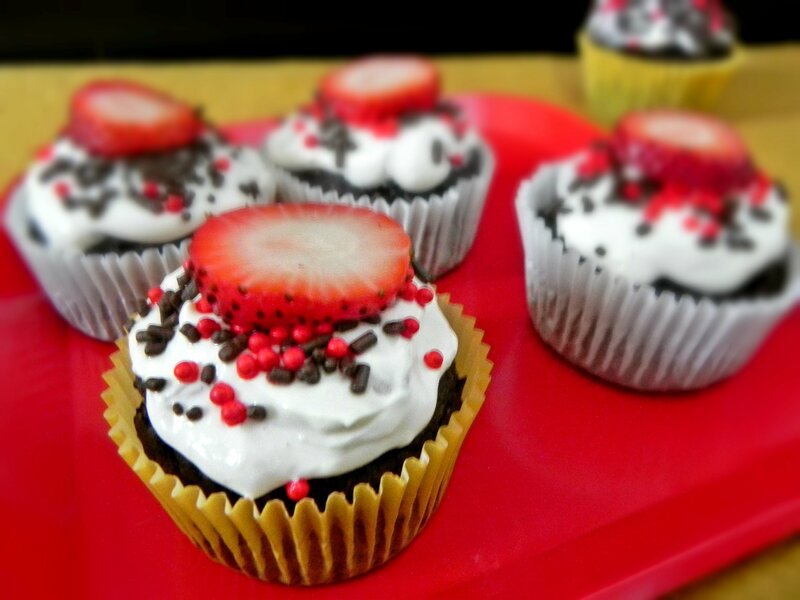 These cupcakes are meant to be a treat and make the perfect healthy dessert for any celebration! Using avocado instead of butter or oil is one of my favorite swaps for baking. It keeps them moist and decadent while eliminating the saturated fats found in bakery-style cupcakes. They are higher in protein than traditional cupcakes, they mostly carbohydrates, so enjoy them with a meal that is high in protein a moderate in fat. Dysphagia Level 1 – Pureed – cook cupcakes according to recipe and put in a blender or food processor, adding milk or water for liquid as needed. Top pureed cupcake with cream cheese frosting. If using strawberries, substitute with seedless strawberry jam and either mix it into the frosting or add it on top. Omit sprinkles. Dysphagia Level 2 – Ground/Mech Soft – cook cupcakes according to recipe. Cut 1 cupcake into small pieces and soak in milk to soften. Top with cream cheese frosting. If using strawberries, substitute with seedless strawberry jam and either mix it into the frosting or add it on top. Omit sprinkles. Dysphagia Level 3 – Soft – cook according to recipe. Omit sprinkles. Preheat oven to 350ºF. Spray 12-cup muffin tin liberally with cooking spray. In a medium bowl combine flour, sugar, baking powder, baking soda, cocoa powder, and salt. Add egg whites to a large bowl and whisk until frothy. Then add mashed avocado, applesauce, vinegar, vanilla, milk and water to the frothy egg whites. Fill 10 of the 12 cupcake liners about two-thirds of the way with the batter. Bake in the oven for 14-15 minutes. Remove from the oven and allow to cool completely before topping with frosting. For the frosting: using a mixer, beat the cream cheese until smooth. With the mixer on low, add the powdered sugar, vanilla, and milk. Top each cupcake with frosting and a strawberry slice if desired. Sprinkles optional, but always accepted!